China’s military on Monday, May 13 conducted the first test of a new ground-launched anti-satellite missile that was fired into space and disguised as a space-exploration rocket, according to U.S. officials. The test was carried out early Monday from the Xichang Space Launch center (in southern Sichuan Province) and was identified by officials as the new Dong Ning-2 ASAT missile. 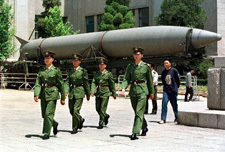 A U.S. official familiar with intelligence reports said the DN-2, as a high earth-orbit attack missile, is a significant advance for China’s program of developing asymmetric warfare capabilities for use against the United States. Others include cyber-warfare capabilities and anti-ship ballistic missiles. It could not be learned if the latest ASAT test involved an impact with a target satellite. While details of the DN-2 are not known, U.S. officials said it is expected to be a high earth-orbit interceptor capable of destroying strategic navigation, communication, or intelligence satellites by ramming into them at high speeds. The DN-2 is said to be capable of hitting targets in high-earth orbit between 12,000 and 22,236 miles above earth. Many military, intelligence, and commercial satellites orbit at that altitude. A Pentagon-State Department report to Congress last year on export controls stated that in addition to ground-launched ASAT missiles, China is building high-technology kinetic and direct energy weapons for ASAT use. Al-Yamama advertises its Kentucky Fried Chicken delivery service on Facebook. A new company has emerged in the Middle East that smuggles fast food from an Egyptian Kentucky Fried Chicken to Gaza residents through a tunnel. People in the conflicted region can now satisfy cravings for food from the Louisville-based fast food headquarters by ordering through a company that charges the American equivalent of $30 for smugglers to bring the greasy goods from Al-Arish in Egypt to the doorsteps of hungry customers. Deliveries take approximately three hours. But for those who use the business, the end result is worth the wait. “It has been a dream, and this company has made my dream come true,” accountant and Gaza resident Rafat Shororo told the publication while getting his delivery. Mohammed al-Madani, who manages the company’s finances, said that the idea for the business came from their own craving for KFC. An associate of his decided to call a friend in Al-Arish with a request to bring chicken through the tunnel to their location. Once the associate orders the food and brings it to the specific tunnel used for the deliveries, tunnel smugglers such as Abu Iyad complete the transfer, though they are not accustomed to assisting in food deliveries. “This is the first time to smuggle such goods,” he said. Once on the Gaza side of the tunnel, Hamas police officers give the chicken permission to go to the delivery person who completes the final leg of the trip. 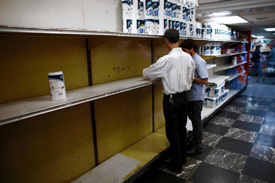 A supermarket in Caracas on Thursday was short on basic products, including toilet paper. CARACAS | First milk, butter, coffee and cornmeal ran short. Now Venezuela is running out of the most basic of necessities – toilet paper. “State-controlled prices – prices that are set below market-clearing price – always result in shortages. The shortage problem will only get worse, as it did over the years in the Soviet Union,” said Steve Hanke, professor of economics at Johns Hopkins University. President Nicolas Maduro, who was selected by the dying Hugo Chavez to carry on his “Bolivarian revolution,” claims that anti-government forces, including the private sector, are causing the shortages in an effort to destabilize the country. He said monthly consumption of toilet paper was normally 125 million rolls, but that current demand “leads us to think that 40 million more are required. We will bring in 50 million to show those groups that they won’t make us bow down,” he said. Patience is wearing thin among consumers who face shortages and long lines at supermarkets and pharmacies. Last month, Venezuela’s scarcity index reached its highest level since 2009, while the 12-month inflation rate has risen to nearly 30 percent. Shoppers often spend several days looking for basic items, and stock up when they find them. b) What do defense officials say China’s ASAT weapons are designed to do? c) What steps are U.S. military space officials taking to strengthen our national security satellites in orbit? b) How much do Gazans pay for their KFC orders? c) What do you think of the entrepreneurial spirit of the KFC smugglers? b) Where does the socialist government place the blame for the toilet paper shortage? c) What is the real reason for the shortage, according to economists? China in 2007 conducted its first successful hit-to-kill ASAT test against a weather satellite in low-earth orbit. The impact left tens of thousands of pieces of debris in orbit that continue to threaten both manned and unmanned spacecraft. Defense officials have said China’s ASAT weapons, including missile interceptors, lasers, and electronic jammers, are designed to disrupt satellite communications and navigation systems used extensively by the U.S. military in conducting joint warfare. Defense Secretary Chuck Hagel stated in written answers to questions during his confirmation hearing in January that the United States would seek to avoid engaging in hostilities in space. The statement was the clearest indication that the Pentagon is preparing to develop “counterspace” weapons in response to Chinese anti-satellite weapons. “The chances are good this is indeed an ASAT test as it was launched from the Xichang Space Launch Center, the same launch site used for the January 2007 successful SC-19 ASAT interception of a Chinese weather satellite,” said Rick Fisher, a senior fellow at the International Assessment and Strategy Center. Xichang is located in southern Sichuan Province. A validated DN-2 ASAT system would provide the Chinese military with the capability to “degrade or severely damage the U.S. Global Positioning Satellite (GPS) system,” Fisher said. Fisher said China has been “preaching” that other states should disarm while Beijing secretly builds space weaponry at the same time it has denied being engaged in the space arms buildup. The United States remains concerned about China’s development of anti-satellite capabilities after Beijing shot a missile at one of its own defunct satellites in orbit in 2007, creating an enormous amount of debris in space. Monday’s rocket launch was similar to launches using the Blue Scout Junior rocket that were conducted by the U.S. Air Force in the 1960s for research on Earth’s magnetosphere, McDowell said in an emailed response to questions. He said all the previous suborbital launches above 6,250 miles had been conducted by the U.S. All China’s previous missile tests went to less than 1,250 miles, although Beijing had launched orbital vehicles higher, including to the Moon, he said. Most scientific suborbital launches are at most 940 miles or so, McDowell added. The 1976 launch was Gravity Probe A, when NASA and McDowell’s institute worked together to launch an atomic clock to 6,425 miles. Monday’s launch came less than a week after U.S. Deputy Defense Secretary Ashton Carter unveiled what he called a “long overdue” effort to safeguard U.S. national security satellites and develop ways to counter the space capabilities of potential adversaries. U.S. military space officials are taking steps to improve the resilience of national security satellites in orbit, the defense official said. These include using new wave forms to make it more difficult for adversaries to jam signals from space, putting U.S. sensors on commercial satellites and using terrestrial high-frequency communications. Last week, the Pentagon released an 83-page report on Chinese military developments that highlighted China’s increasing space capabilities and said Beijing was pursuing a variety of activities aimed at preventing its adversaries from using space-based assets during a crisis. In 2005 Israel withdrew all troops and settlers from the Gaza Strip in an effort to establish peace with Palestinians. In 2007 Hamas took control of Gaza after defeating Fatah in armed conflict. Hamas’ objective is to destroy the state of Israel. Since the Egyptian–Israeli Peace Treaty 1979, a 100-meter-wide buffer zone between Gaza and Egypt known as the Philadelphi Route was established. The international border along the Philadelphi corridor between Egypt and the Gaza Strip is 7 miles long. Since the Hamas overthrow 2007, the Philadelphi Route has been controlled by Hamas and the Egyptian army continues to destroy Gaza Strip smuggling tunnels as a countermeasure against terrorism. The Gaza border crossing into Egypt remains under the full control of Egypt. Egypt has alternately restricted or allowed goods and people to cross that terrestrial border. The government’s assurance that it will import 50 million rolls to boost supplies (and 760,000 tons of food) was little comfort to consumers struggling to find toilet paper on Wednesday. Finance Minister Nelson Merentes said the government was also addressing the lack of foreign currency, which has resulted in the suspension of foreign supplies of raw materials, equipment and spare parts to Venezuelan companies, disrupting their production. “We are making progress … we have to work very hard,” Merentes told reporters Wednesday. Many factories operate at half capacity because the currency controls make it hard for them to pay for imported parts and materials. Business leaders say some companies verge on bankruptcy because they cannot extend lines of credit with foreign suppliers. Merentes said the government had met the U.S. dollar requests of some 1,500 small- and medium-sized companies facing supply problems, and was reviewing requests from a similar number of larger companies. [Deceased President] Chavez imposed currency controls a decade ago trying to stem capital flight as his government expropriated large land parcels and dozens of businesses.